The global sheet metal fabrication services market is anticipated to expand at a CAGR of 1.7% during the forecast period 2018 to 2026. This is due to growing demand for ready to install fabrication products and components in several end-use industries such as industrial machinery, automotive, construction, and others. Sheet metal fabrication service providers are adopting prefabrication techniques to meet the increased demand. This is expected to contribute to the growth of the sheet metal fabrication services market. Sheet metal fabrication services are an integral part of various end-use industries. With increased demand in the Asia Pacific region, manufacturers are shifting their base to this region which is boostingthe growth of the sheet metal fabrication services market in Asia Pacific.The market in Asia Pacific is expected to growat a CAGR of 2.3% over the forecast period. 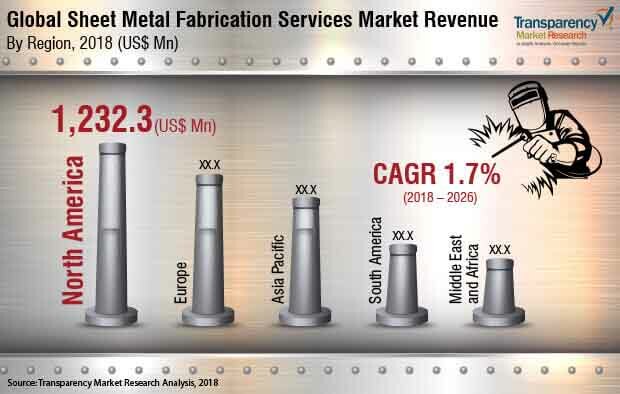 Investment in various industry verticals such as automotive, industrial machinery, construction and electronics, aerospace, and defense are expected to create new opportunities for the sheet metal fabrication services market. In terms of industry vertical, industrial machinery segment held the major share of US$ 879.9 Mn in 2017 and is anticipated to expand at a CAGR of 2.1% during the forecast period. The dominance of the industrial machinery segment is attributed to the rise in production of various industrial machineries in North America and Asia Pacific. Increasing demand for electronic products in these regions for residential and industrial industry is driving the sheet metal fabrication services market. Manufacturing in North America continues to evolve and hence remains a driving force of innovation. Manufacturers in the United States use technology to invent new machinery products which increases the demand for sheet metal fabrication. Asia Pacific will reinforce its position as the world’s largest construction market over the coming decade. Sheet metals such as steel and aluminum are strong, durable, and corrosion resistant and are often used in the construction industry. Sheet metals are used to form door frames, pipes, and staircases. The sheet metal fabrication services market is segmented in terms of form, material, industry verticals, and geography. By form, the market is divided into bend sheet, punch sheet, cut sheet, and other forms. The bend sheet segment is expected to expand at a high CAGR of 1.9% during the forecast period due to its applications in construction, telecom, electronics, and manufacturing industries across the globe. Rise in urbanization and increased construction activities are driving the growth of the bend sheet segment globally. For most applications however, bending will produce essentially no change in the thickness of the sheet metal. By material, the market is classified into steel, aluminum, and others. Steel is further segmented into grade 301 stainless, grade 304 stainless, grade 316 stainless, grade 410 stainless, and others. Grade 301 stainless and grade 304 stainless dominated the market revenue share in 2017. The steel segment is expected to register CAGR growth of 1.9% over the forecast period dueto its high performance, availability, and high adoption in various industries. Steel is quickly becoming the building material of choice for many large construction contractors. Steel beams and columns, joists, studs, and aluminum framing are the common applications of steel sheets in the construction industry. By industry verticals, the market is segmented into industrial machinery, construction, aerospace & defense, automotive, electronics, telecommunication, and others (medical, energy and power, etc.). The construction segment is expected to expand at a CAGR of 1.6% during the forecast period due to the growth of the sheet metal fabrication services market in APAC and MEA regions. Asia Pacific is becoming a major hub for various construction activities due to rapid urbanization in this region. Construction is a sector where sheet metal is extensively used for various applications such as cladding used to cover the buildings. Anti-slip surfaces can also be made by sheet metal fabrication. North America is anticipated to account for major market share due to increased construction projects and strong defense and aviation industry. The market in Asia Pacific is projected to witness highest CAGR of 2.3% due to increased manufacturing and construction activities in this region. Various industries such as construction, automotive, industrial machinery, and electronics are in the process of expanding their facilities in this region. Growth of the manufacturing industry is due to the easy availability of raw materials and cheap labor. Moreover, Asia Pacific is witnessing growth in the construction industry owing to rapid rise in urbanization. The global sheet metal fabrication services market is highly diversified. Sheet metal fabrication service providers are developing new products and services by incorporating advanced technologies. Some of the industry participants of the global sheet metal fabrication services market are All Metals Fabricating, Inc., BTD Manufacturing, Inc., Classic Sheet Metal, Inc., Dynamic Aerospace and Defense Group (Hydram Engineering), Ironform Corporation, Kapco Metal Stamping, Marlin Steel Wire Products LLC, Mayville Engineering Company, Inc., Metcam, Inc., Moreng Metal Products, Inc., Noble Industries, Inc., O’Neal Manufacturing Services., Ryerson Holding Corporation, Standard Iron & Wire Works, Inc., and The Metalworking Group. This report on the global sheet metal fabrication services market provides analysis for the period 2016–2026, where 2017 is the base year and 2018 to 2026 is the forecast period. Data for 2016 has been included as historical information. The report covers market dynamics including drivers, restraints, opportunities, and trends expected to influence the growth of the sheet metal fabrication services market during the said period. The study provides comprehensive analysis on market growth throughout the above forecast period in terms of value (US$ Mn) across different geographies. Economic diversification in areas such as biomedical engineering, electronics, industrial machinery, and medical sciences is set to attract investments into various countries in North America, Europe, and Asia Pacific. As these industries grow, demand for machining tools, semiconductors, and electronic products are expected to increase in tandem, thus creating indirect opportunities for the sheet metal fabrication services market in different regions. Opportunities remain positive as governments across the globe are continuously structuring and developing plans to promote these new industrial areas. Additive technology has gained growing interest in the field of sheet metal fabrication services in recent years. Metal fabrication is a broad business, and additive manufacturing offers serious potential for a surprising number of applications, from scale models of large fabrications to a variety of tools and fixtures. The sheet metal fabrication services market has been segmented based on form, material, industry verticals, and geography. Based on form, the market has been classified into bend sheet, punch sheet, cut sheet, and other forms. In terms of material, the market is divided into steel, aluminum, and others; By industry verticals, the market is classified into industrial machinery, construction, aerospace & defense, automotive, electronics, telecommunication, and others (medical, energy and power, etc. ); Geographically, the report classifies the market into North America, Europe, Asia Pacific (APAC), Middle East & Africa (MEA), and South America. The report also includes key developments in the sheet metal fabrication services market. Porter’s Five Force Analysis which identifies bargaining power of suppliers, bargaining power of buyers, threat from new entrants, threat from substitutes, and degree of competition is included in the report. Value chain analysis which shows workflow in the sheet metal fabrication services market and identifies raw material service providers and distribution channels are also covered in the report. Segment trends and regional trends are part of the report. It also covers segment-wise comparison matrix, incremental opportunity analysis, and market positioning of key players for all regions covered in the scope of study. The report includes competition landscape which covers competition matrix and market share analysis of major players in the global sheet metal fabrication services market based on their 2017 revenues, and profiles of major players. Competition matrix benchmarks leading players based on their capabilities and potential to grow. Factors including market position, offerings, and R&D focus are attributed to a company’s capabilities. Top line growth, market share, segment growth, infrastructure facilities, and future outlook are attributed to a company’s potential to grow. This section also identifies and includes various recent developments carried out by leading players of the sheet metal fabrication services market. Company profiling includes company overview, major business strategies adopted, and key developments. The companies profiled in the global sheet metal fabrication services market include All Metals Fabricating, Inc., BTD Manufacturing, Inc., Classic Sheet Metal, Inc., Dynamic Aerospace and Defense Group (Hydram Engineering), Ironform Corporation, Kapco Metal Stamping, Marlin Steel Wire Products LLC, Mayville Engineering Company, Inc., Metcam, Inc., Moreng Metal Products, Inc., Noble Industries, Inc., O’Neal Manufacturing Services., Ryerson Holding Corporation, Standard Iron & Wire Works, Inc., and The Metalworking Group.